PennsylvAsia: Pittsburgh Sakura Project photo contest. 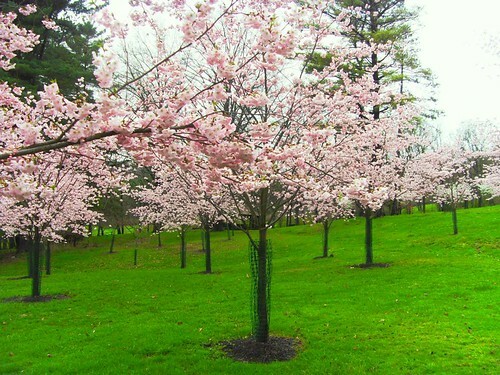 A rainy March day in 2012.
seek[s] photos showing the scenery in North Park that convey the beauty of the cherry trees the Pittsburgh Sakura Project has planted. Photos may also show people and pets enjoying the trees. More information can be found on the Pittsburgh Sakura Project's webpage. Because, unfortunately, the cherry blossoms don't frame the boathouse or the nearby picnic groves particularly well, it will be a time to get creative with angles, subjects, and poses. The top three photographers will win gift certificates to Chaya Japanese Restaurant in Squirrel Hill. Also according to an April 17th post on the website, the blossoms there are in full bloom.